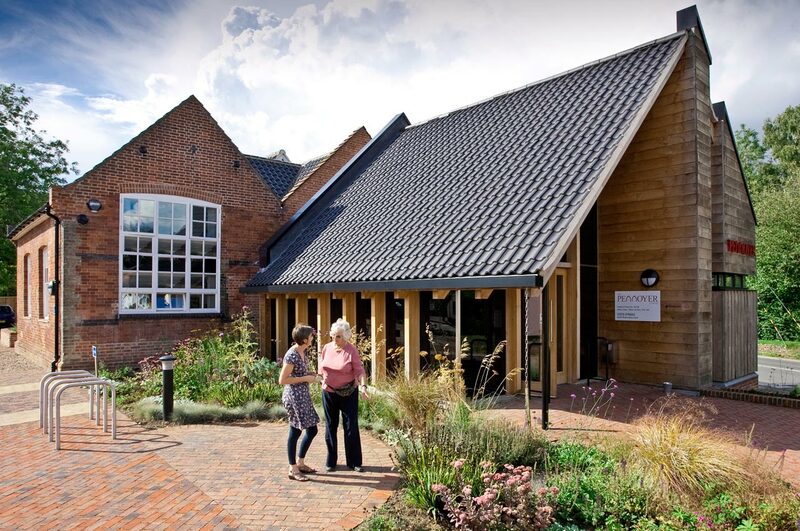 The Pennoyer Centre in Pulham St Mary, is a £1.6m community-led project transformation of a grade II derelict mediaeval guild chapel and Victorian school buildings into a new village centre. The project demonstrates how environmental, social and economic sustainability can be applied to the re-use of an historic building at risk, to create a well-loved community asset with a secure long-term future. Amongst other things, the complex contains a large community hall, meeting rooms, an IT suite and an internet café. Twenty years of dereliction and several unimplemented consents ensured a very positive approach from the Local Planning Authority and County Historic Buildings Adviser. A new floor inserted in the Victorian school building has increased the available floor area in a building on a very tight site and has allowed the new extension to be modestly sized, not dominating the historic fabric. A dropped ceiling and partitions were removed from the C15th guild chapel, restoring much of its original character. Well-researched restoration of the historic fabric has been comprehensive, involving a range of traditional skills – stone-work, leaded glazing, lime-pointing/render. The addition of high levels of insulation has increased the buildings sustainability without compromising the historic fabric. A laminated oak frame and oak cladding were used for the new extension, with extensive glazing sheltered by an over-sailing clay tiled roof. Finishes throughout are environmentally friendly and low-maintenance for reduced running costs – oak and linoleum floors, oak panelling, stainless steel and glass, micro porous high-build stain and powder coating to aluminium windows.